I am starting off this blog feeling rather speechless. Speechless because for the first time in my life I don’t have an answer or a plan that I am satisfied with. All of my answers depend on a shady source that doesn’t have a good track record in being dependable. And although I am one for adventures, I also take comfort in knowing things are within my control, well you know, as much as we can possibly control. We are all programmed to survive. So what happens to you, when the thing that you have depended on the most has been taken away, altered or misled you to a dead end? When we were younger, we are told that our education is one of the most important things that we can have and that it opens up more opportunities in your future. We are sent to school every day and taught lessons that lead us into the bigger picture. Letters become words; words become sentences and sentences become ideas. After thirteen plus years we then choose a path that we hope will be enough to support us and hopefully something that we enjoy doing, because just like school, work becomes the majority of our lives. Everything is so neatly orchestrated. Degrees are exchanged for dollars and we begin our “life” as a professional. The hard work eventually pays off after a decade of entry-level positions. We are taken more seriously and given better compensation for our now “expertise”. It is what most people today strive for; a dream job, enough paper to support vacations, a modest home, a reliable car and hopefully enough to stash away for a “rainy day” and retirement. But what happens when this plan derails? What happens when we are no longer able to do the thing we have been working towards our entire lives? This is a scary reality by many in the world who face chronic illness. I never, not even once thought, “well, when I get sick in my mid thirties and lose my career, I will…” I thought that the odds were more likely for me to get divorced, go through bankruptcy or lose a job but be rehired within 6 months. I was prepared for those scenarios. I wasn’t SUPPOSE to be get sick. Recently I have been faced with a scenario that has made me very anxious. I have found myself outside, looking in on the life that I am leading. (Almost like a Christmas Scrooge of looking at the past, present and future). The past was filled with dedication, long hours, sacrifices, college debt and a dream of a secure future. The future moment is not a detailed portrait by any means but it conveys a feeling of happiness and fulfillment helping people in ways that are satisfying. There is no worry of finances and how I will eat my next meal but my work seems to be on the creative side. Although I cannot tell what I am doing, I see myself working in a non traditional manner which isn’t all that surprising as I love thinking out of the box. Just as I lean in to get a better grasp on what lies ahead for my future self, the curtains are abruptly closed in my face. Where is my light at the end of the Tunnel? So here I am, in the present moment. Having a balanced practice in Meditation has allowed for me to be more aware of my emotions, my body’s response to different environments. Meditation has also been helpful in structuring a schedule that allows my body to get the rest that it needs (although from previous posts you may know I still struggle with pacing! ), and the space to breathe through anxiety. But, I am restless in these moments. The last two weeks have been filled with “what ifs” and there are no answers that I am accepting as the truth. There aren’t even decent suggestions that I feel comfortable in pursuing. My identity is: Kelly the Social Worker. Kelly, the Therapist. Kelly who is independent and successful. Kelly who does what she wants. My current health situation has been chaotic and I have engaged in many battles with my mind and my body determining what I really need right now. What is my next step? Two months ago I was taken in for a routine procedure of removing an ingrown toenail and my body reacted in such a confused, perplexed and angry manner. My body refused to return to the schedule of work and rebelled so violently that I was left defenseless, asking for Short Term Disability while I got myself together again. So here we are 7 weeks later. I have successfully completed 13 official physical therapy sessions, 7.5 hours in the pool and have gone from a wheelchair, only able to get 1 shoe on, to crutches with a surgical shoe, to walking 5,000 steps a day without any assistive devices and socks and shoes on both feet. I am proud of myself. I am just as proud of this moment as I was to obtain my Graduate degree and Clinical License. I put all of my motivation, determination and hard work into succeeding in Physical Therapy, unsure of how this would look like in the end. The most terrifying thing with CRPS is that it looks different every damn day. Hell, it even looks different from moment to moment. My affected feet go from pale white to deep red and purple in less than three minutes. My pain shoots out of nowhere and leaps from a 3 on a pain scale to 10 with no triggering factor. Some days I can wash the dishes and make a meal. Some days I crawl and make bowls of cereal. CRPS is a moving target. A Rebel without a cause. A Thief. A miscommunication. A terror. An unexplained disease. No one know why, how and even the treatments are changed drastically as they find out the disease is just too complex. This is the hardest thing I have ever had to do. To live with a rare disease is exhausting. 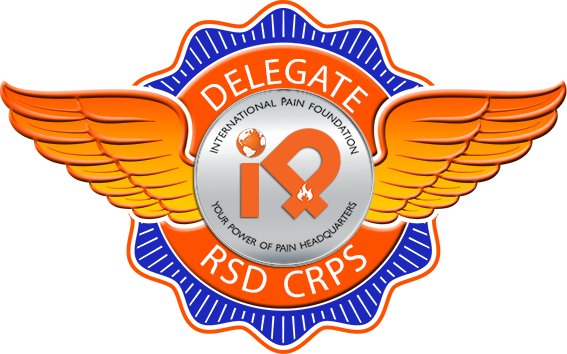 I know more about CRPS than most specialists. Although that doesn’t make me an expert because what works with me, may not work with someone else. What works today may not work tomorrow. It may not even work into the afternoon. This is why I can’t see in the future more than the next 5 minutes. This is also why I often cancel plans with friends, have stop making social obligations and have spent the majority of the last year in isolation. My pain has gone from a monster that limited my physical ability to a gigantic mammoth that now has consumed my life, my friendships, my relationship and now is attacking my career. Many meditations have led me to a feeling of peace inside my heart that knows that I will be okay in the end. The anxiety lies in the scary transition, asking the difficult questions. Will I be able to continue the job that I love? Will I be able to get to work and be the clinical social worker that I have worked so hard to be? Will I be able to continue to make a difference in clients’ lives and continue to fight for much needed change in my field? Will I still be a strong advocate? Will I have enough energy to make new friends, try new hobbies and go on dates with the man that I love? Will I travel to new places and collect sand from beaches around the world? Or will the next few years precede like the last one. Consumed by pain, sleeping through every weekend, using my personal leave days for hospital stays and having to cancel dinner dates with my love? Laid in bed all day to reserve my energy for a 20 minute paddle on the lake with my love. If it were up to my willpower alone, I would make strides in every aspect of my life. I would continue to push through my career while managing pain. I would be able to hide my CRPS side from everyone because it wouldn’t interfere with my life. But CRPS knows no boundaries. And in order to be fair, I must let others know that the inconsistencies are CRPS not a flawed factor of my character. In order to be fair to myself, I have to take a break. I have no idea. I am doing the best that I can with what I have been given. I am pursuing happiness & balance. I am listening to my body and allowing the time and space that it needs to function. I am no longer fighting pain with resistance. I am fighting it with love and compassion. I cannot control my CRPS but I can control my breath. I can control who is in my circle of support. I can control the kindness of my actions. More importantly I can control the loving kindness that I show myself. Pingback: Who is this body?